OCTOBER 23, 2015 at 7 p.m.
And OCTOBER 24, 2015 at 2 p.m. and 7 p.m.
A thrilling evening of tales about ghosts, madness, witches, vampires, & werewolves – all of them LIVE! ON STAGE! A campfire ghost story telling contest gets serious when one participant tells the tale of a grieving husband burying his wife out on the prairie, but then he remembers her artificial arm was made of gold – “Where’s my arm?!!!!”. “I knew the house was haunted the first time I saw it—“, and so does the landlord. He’s renting it to a ghost. Is she a witch or is she a vampire? The only person who knows is going mad trying to get people to believe the terrible things that have happened. Millie Cushman, an American expatriate, is trapped in Paris during World War Two trying to survive until a very strange refugee appears in her garden during the full moon. Mr. Nuttle is vacationing with a man who’s out to drive him mad! REMEMBER, “HORRORS!” is a Halloween play for grown-ups. Please, leave the little ones at home. The play is recommended for ages 13 and above. ALL Performances are at the Gayton Kirk –11421 Gayton Road, Henrico, Virginia 23238. Three-Penny Theatre productions are “pay what you want” performances; every audience member names their own ticket price, $1, $3, $5, $10, $15 or more – any price they want to pay. For tickets click on Reserve Tickets at the top of this page OR e-mail 3pennyplays@gmail.com OR call 741-5254. Mark Atkinson – Onstage Performer & Dramaturg: Mark acted in Chicago at the Goodman Theatre, Chicago’s Theatre for the Deaf, Lyric Opera of Chicago, The Body Politic Theater. He was also the Mascot for the White Sox and Chicago Bulls. Will Atkinson- Onstage Performer: Will last appeared as the Young Edgar Allan Poe the Three-Penny production The Rivah Home Companion. He was active in theatre in school, appearing in a variety of roles on stage and in short films. Ellen Bode – Director & Dramaturg: Ellen has been a producer for Virginia Rep’s Bifocal Players. She is on the board of Richmond’s Chamberlynn Actors Theater (CAT). In 2011 Ellen received CAT’s lifetime achievement award. Lorrie Carver – Technical Director: Lorrie worked the national tour of “Smokey Joe’sCafé” and did the lighting for country music star Lilah McCann. Ray Carver – Playwright & Onstage Performer: Ray has worked for theatres across the country. The Minneapolis Star-Tribune says he “catches the essence”. Chicago’s Writer To Writer magazine says he “spins a ripping good yarn. Ann Davis – Onstage Performer & Dramaturg: Ann has worked in all aspects and levels of theatre with companies all across the United States, including San Diego’s Old Globe and Wolf Trap in Washington D.C. She is also artistic director of Richmond’s Huguenot Community Players. Amber French— Music Director & Onstage Performer: Amber directs and acts in Northern Virginia: including Fredericksburg’s Riverside Dinner Theater, CYT theater, and CCT theater. Besides “Horrors!” she is currently working on a production of “Into The Woods”. Amber has appeared in several films, including an upcoming project for Netflix. Ryan Schuyler – Sound Technician: Ryan is an educator who remembers how important the arts were for him in school as a way to express himself. He is out to ignite that spark in his own students now in class and by his own example of getting involved in helping to create theatre in Richmond. Steve Snyder – Playwright: Former member of the Minneapolis Playwrights Center. Steve is now a Humanities professor at Grandview College. DECEMBER 19, 2015 at 2 p.m. and 7 p.m.
All the Halloween ghost stories you enjoyed in October are just a memory, but not all ghost stories are for Halloween. 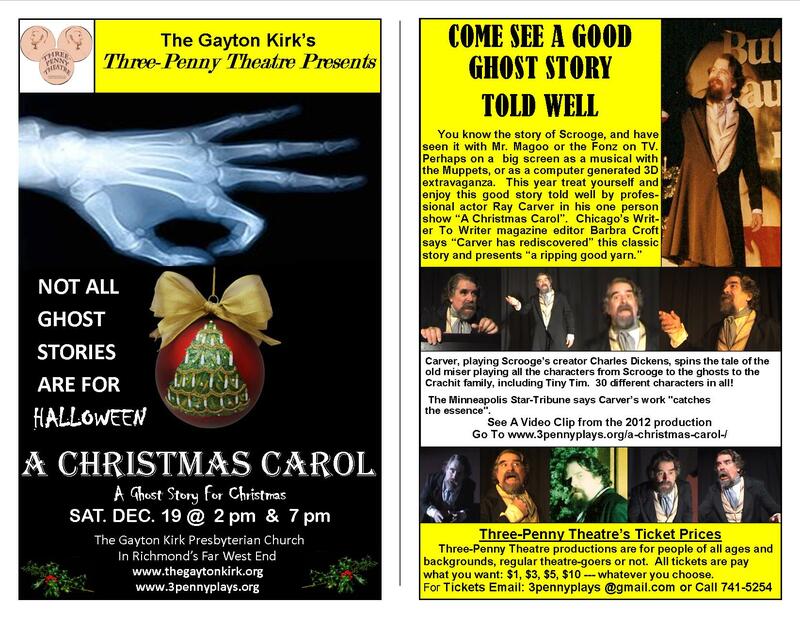 This Christmas season come see the Gayton Kirk’s Three-Penny Theatre production of “A Christmas Carol: A Ghost Story for Christmas”, live on stage Saturday December 19 at 2 p.m. and 7 p.m. at the Gayton Kirk in Richmond’s Far West End. Carver, plays Scrooge’s creator Charles Dickens, spins the tale of the old miser playing all the characters from Scrooge to the ghosts to the whole Crachit family, including Tiny Tim. 30 different characters in all! The Minneapolis Star-Tribune says Carver’s work “catches the essence”. This one day only event happens on December 19th at 2 p.m. and 7 p.m. at the Gayton Kirk –11421 Gayton Road, Henrico, Virginia 23238. Bring the family, this production is affordable and appropriate for children 5 and above. Nursery will be available for children 5 and under.